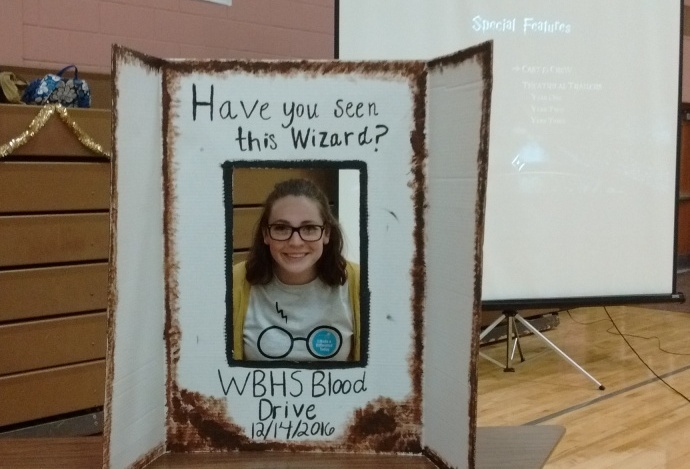 The blood drive has been held in years past, but this year StuCo added some extra spirit by creating a Harry Potter theme. For Kelly Sorce, a family and consumer teacher and StuCo adviser, it was a dream come true. “I’ve literally been trying ever since I’ve been in this high school doing student council to do like a dance or something Hogwarts-themed. So they finally went with it for the blood drive. So I’m pretty pumped,” Sorce said. Maggie Kieser, an East senior on StuCo, has a similar opinion on the theme. “For me it was really fun that my senior year it was a theme that was a uniting theme that brought together people from all different kinds of background. That’s where we got the ideas, everyone will recognize it and get excited about it,” Kieser said. The enthusiasm from the students because of the Hogwarts theme helped to fulfill Sorce’s goal to run a successful blood drive. “Our goal was primarily just to get as many people in as we could, run a really good blood drive, have some good food. We always have the goal to get in as many community members as we can,” Sorce said. Despite the fact that this year’s numbers were lower than usual, the blood drive was still a great success. Compared to the past, this year ran much smoother with a quicker turnover time. “Sometimes we have a couple kids who loiter around and abuse the system. But this year everybody has been good and they system has been smooth and people have been getting through in a quick time, even during our busiest time,” Sorce said. 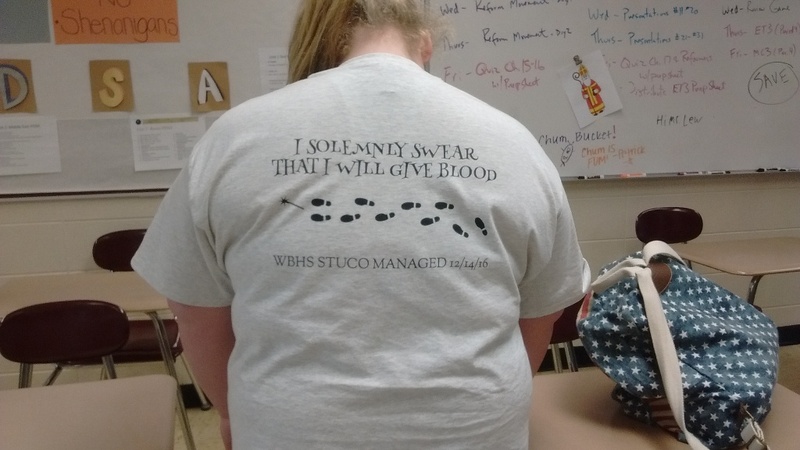 Many students were excited about the theme, some coming to the blood drive decked out in their Harry Potter gear. “I like it a lot. It’s really cool, especially because they are rebooting the Harry Potter books,” East junior Kasey Butcher said. Potter fans like Butcher certainly were not disappointed when it came to decorations. As one entered the gym they passed through the “nine and three quarters platform” (aka the gym doors), and was greeted by a projector with a continuous stream of Harry Potter movies, and the four house coats of armor hung along the wall. StuCo members painted those logos on the back wall. Even the new addition of the sock drive this year was Harry Potter themed, based on the well-known scene where Dobby the house elf gains his freedom when his master throws Harry’s sock at him (that statement makes a lot more sense if one has read the books or seen the movie). The sock drive benefits the local organization Holiday Hope, which helps out needy families. “Teachers can nominate students who they think don’t have the greatest family situation or their families might not have a lot of money or a good Christmas experience,” said Melissa Werth, an East math teacher and StuCo adviser. Holiday Hope provides these students with a Christmas lunch, as well as gifts such as gloves, hats or socks. The spirit of giving that both the blood drive and the sock drive promoted was reflected in students’ views. “It’s one way you can contribute to society, giving blood. And it helps out, so why not,” East sophomore Lindsay Kramer said. Butcher agrees with Kramer, and she has the knowledge to back it up. “I feel like it’s really important to help out, because statistics show that everyone gets blood at least once in their life,” Butcher said. The urge to give back is not confined to just the students, and Tony Zappia, a West social studies teacher, proved that. He views the Hogwarts theme as a great way to incentivize students to give. “Anything to get kids to come down here and give blood. Because the bottom line is that if they start at this age, they are givers for life. It’s a beautiful thing,” Zappia said. The members of StuCo have been working on being givers for over a month as they prepared for the blood drive. A compact list of the assignments entails decorations, food, sign-ups, fundraising, and organizing the sock drive. Much of the work was split up into student committees, and about 15 students came to help run the blood drive during school on Wednesday. “I just have to say that I have an awesome group of kids. They worked so hard on this the last couple of months, and I’m so proud of them,” Sorce said. Sorce continues to have faith in the students as she looks forward to next year.